It has been said that while Jimmy Stewart was the actor with whom Alfred Hitchcock most identified, it was Cary Grant who he wanted to be. Well, who wouldn't? In Rear Window, when Lisa Fremont purrs to L.B. Jeffries "I could see you looking very handsome and successful in a dark blue flannel suit" she might be envisioning Roger Thornhill (imagine how those two could take Manhattan!) It's as if she's saying to Stewart "Why can't you be Cary Grant?" January 18th marks Cary Grant's 107th birthday. 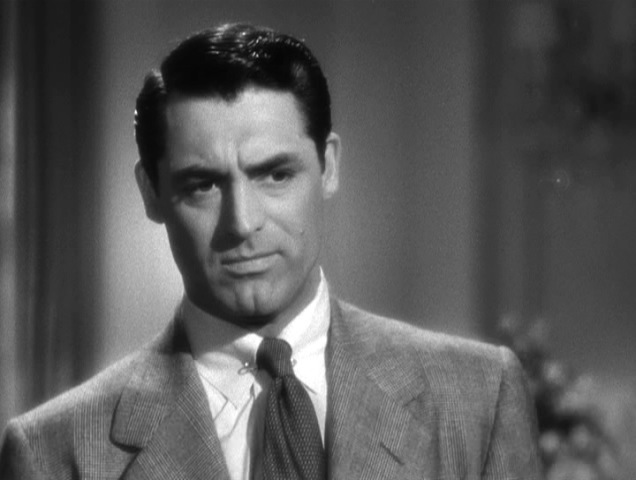 When the question "Does Cary Grant ever get old?" was posed to Facebook's Alfred Hitchcock Geek crowd, the response was an immediate and resounding "Never!" While other romantic heroes of celluloid yore fade into arcane antiquity, today's actors are still compared to Cary Grant. He remains a movie star. In her comprehensive examination of Grant, "The Man From Dream City," critic Pauline Kael suggests that were it not for Alfred Hitchcock, Cary Grant too might have languished in obscurity. It was Hitchcock who rescued Grant from the sentimental forties glop like Penny Serenade where he was mired after his thirties screwball heyday. 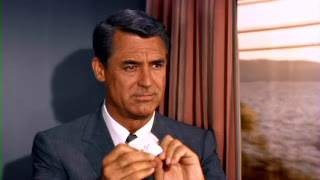 Kael cites Notorious, To Catch a Thief, North By Northwest along with the heavily Hitchcock-scented Charade (directed by Stanley Donen) as the movies that cemented the glamorous figure that Cary Grant so deftly embodied. Cary Grant was something rare and treasured -- a male love object. He could be hard to get -- cynical and wary of emotional involvement -- but as Mae West pointed out, he could also be had. Of course it would take a woman of uncommon stuff to land this dreamboat. Hitchcock's mighty blondes Alicia Huberman, Frances Stevens and Eve Kendall were three up to the challenge. Each possessed the requisite strength and aggression in her deceptively fine-boned demeanor. Sitting a little apart from those films is Grant's first hook-up with Hitchcock, 1941's Suspicion. Many find this film and Grant's character, Johnny Aysgarth, problematic. There is that pesky ending dictated by a studio refusal to see Cary Grant as a murderer (cheating, lying and stealing being acceptable to execs.) The tacked on ending is jarring but it doesn't compromise Grant's performance as much as some would suggest. Whichever way it ends, the significant part of the story is that Lina thinks he is going to kill her -- the drama, whether real or imagined, is played in her mind. What other actor could make her resistance to flee in the face of her fears so believable? Aysgarth is one of the few Grant characters who actively goes after a woman. But never, in his pursuit of mousy Lina MacKinlaw, do we see him as a victim of love. Even as the hunter, he is still the love object. Grant's Aysgarth is a festival of the irresponsible and the irresistable. Exuberantly bearing mink coats and puppies while continuing to indulge in his more nefarious habits. He smoothly plays the darkness beneath the light. The world would be a dimmer place without Cary Grant. But Cary Grant would not have shined so brightly without Alfred Hitchcock. Hitch brought out in Grant that thing he himself so coveted--the ability to effortlessly light up the passion in the world's most desirable women. Hitchcock's Cary Grant is the flip side of Hitchcock's Jimmy Stewart. There would be no messy obsessions from from this man. 107 years old and he still sails through our yearning gaze. 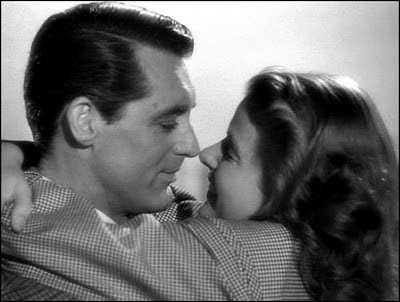 In Notorious Ingrid Bergman laments on behalf of the smitten as she coos into Cary Grant's ear, "I'm only fishing for a little bird call from my dream man." I completely agree with your analysis about Hitchcock's view of Grant and Stewart. But, I do think you do a Grant a disservice when you don't mention his comedic side (which he also brought to Hitchcock films--developed in three romantic comedies with Katharine Hepburn in the late 1930s, early 1940s). The three I'm referring to are the screwball comedy Leo McCarey's Bringing Up Baby. The warm Philip Barry written comedies Holiday and the more sophisticated Philadelphia Story (most like the hero in North by Northwest--and the former Philadelphia debutante Grace Kelly in Rear Window, To Catch a Thief, etc.). For those of us who like Hitchcock identify with Stewart and wish to be Grant,but eventually break in favor of the former. I think the break comes with The Philadelphia Story, where Stewart becomes who we identify with (a regular talented poetic guy albeit a bit frustrated with a false hard-boiled covering over a softie) and where Grant becomes a bit too perfect, polished and smooth for us. Hey, Joel: Thanks for doing this. I agree completely with your take on Suspicion. I think it's one of Grant's best performances. Notorious is perhaps more perfect because the compromised ending does detract from Suspicion. Well Happy Birthday to Cary Grant today! To Catch a Thief is my favourite. Good info thanks. 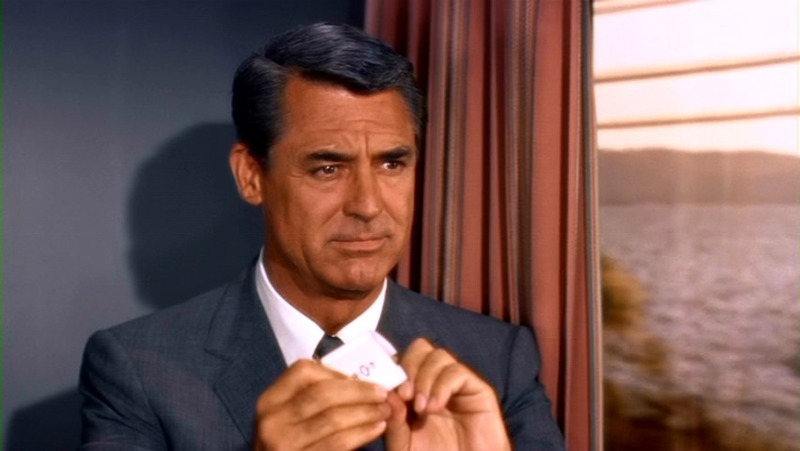 Jeff-for-Progress, I'm with you all the way on Cary Grant's comedic talent. Actually, Howard Hawks directed "Bringing up Baby" but Leo McCarey did direct one of Grant's most sublime screwball outings, "The Awful Truth" with Irene Dunne. For non-Hitchcock Grant I have always been partial to Hawks' "His Girl Friday." Thanks for your thoughts Jennythenipper and Juliette. It's interesting how with those three films you mention, the Grant persona stays intact and yet they are three wholly different characters. He's so good.